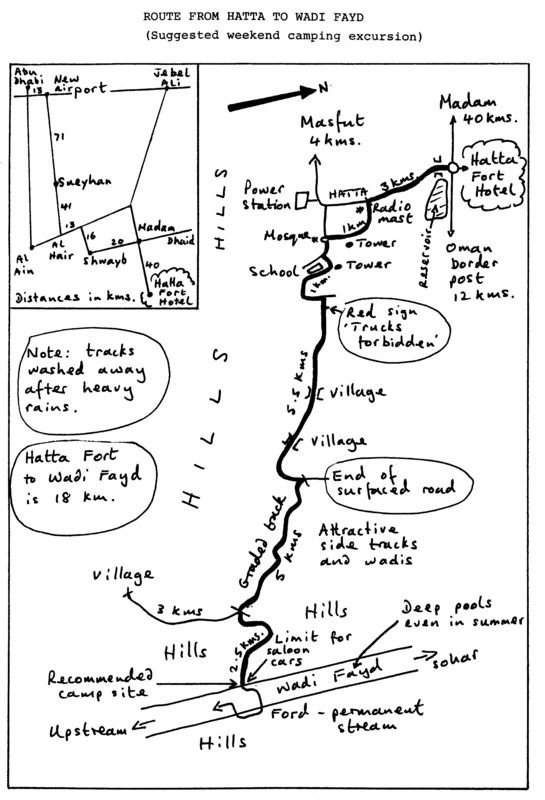 The route-map opposite is suitable for non four-wheel drive vehicles, though the graded track is likely to be cut by flooded wadis in winter. Extra care should therefore be taken immediately after rainy periods. The end of the surfaced road is technically just inside Oman but there is no checkpoint and no attempt has been made from either side to deter us from traveling. Opened in 1981, the grounds are already well-grassed. Toads are numerous in pools and fountain areas. The entrance drive is flanked on the right by a large clump of Aloe vera, a succulent 'red-hot poker' plant. This is particularly suited to this area, though originally introduced, and is prevalent on old grave yards throughout the hilly border area. (Oppose it and to the left of the Hotel entrance) It is very new and its ecological impact difficult to assess though one can hope that it may become a wildfowl habitat. The sides of the bridge across the roundabout to Hatta town are occasionally flooded and a good place to look out for unusual plants a month or so after heavy rain. Though it has lost its charm, Hatta is still a relief after the long flat drive from Abu Dhabi. 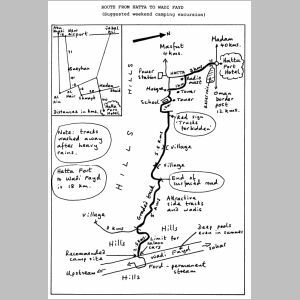 There are several wadi tracks worth pursuing into the hills but a four-wheel drive vehicle and foot-slog are required. Permanent water pools can be found further up some of the wadis. The fairly large oasis area of the town provides good cover for a number of birds. This begins some 6km east of the town, at a sharp right angle just before the end of the metalled road. It is not sign-posted but is wise and cannot be missed. The first few kilometers are through undulating badland but the landscape becomes more interesting as the first deep wadis are encountered. Water pools can be found in several of them, with associated plant, insect and aquatic life. A very wide wadi crossed by a ford. This is the cautious limit for non four-wheel drive vehicles. Flood marks indicate the raging torrents which must occasionally road through. Upstream, it broadens out to a broad pebbly stream with sheer water-cut sides of hardened conglomerate. Side wadis are all worth investigating for plants, reptiles and fish. Downstream the perennial stream descends into a narrow, very deep gorge, virtually underground for 0.5km. Here water pools are up to eight meters deep even in mid-summer. Good camping spots are adjacent to the ford.